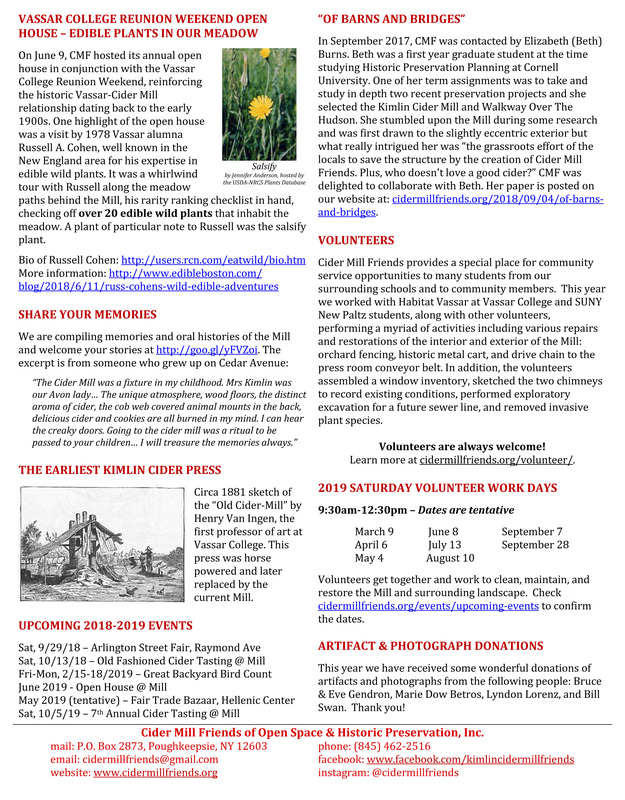 Check out our newsletter, hot off the presses! This entry was posted in Uncategorized on September 20, 2018 by cidermillfriends. Please share and spread the word! See you October 13th! This entry was posted in Uncategorized on September 17, 2018 by cidermillfriends. In September 2017, CMF was contacted by Elizabeth (Beth) Burns. Beth was a first year graduate student at the time studying Historic Preservation Planning at Cornell University. One of her term assignments was to take and study in depth two recent preservation projects and she selected the Kimlin Cider Mill and Walkway Over The Hudson. She stumbled upon the Mill during some research and was first drawn to the slightly eccentric exterior but what really intrigued her was “the grassroots effort of the locals to save the structure by the creation of Cider Mill Friends. Plus, who doesn’t love a good cider?” CMF was delighted to collaborate with Beth. This entry was posted in Uncategorized on September 4, 2018 by cidermillfriends. This year marks the 6th year of our annual cider tasting event which will take place Saturday, October 13. The event will showcase several local ciders – including our own Kimlin Cider – to sample with our specialty tasting glass, host a cookout with Chocolate Mousse Catering, give behind-the-scene Mill tours, and treat guests to raffles, entertainment, hands-on activities for children and live music by the Roundabout Ramblers. This year we welcome an exhibit by the Dutchess County Sports Museum, including Ralph Kimlin’s contributions to local sports history. The Tasting is our major fundraiser and proceeds benefit the stabilization and restoration of the Kimlin Cider Mill and surrounding open space. We invite you to join us as a sponsor of this event which is our major fundraiser. 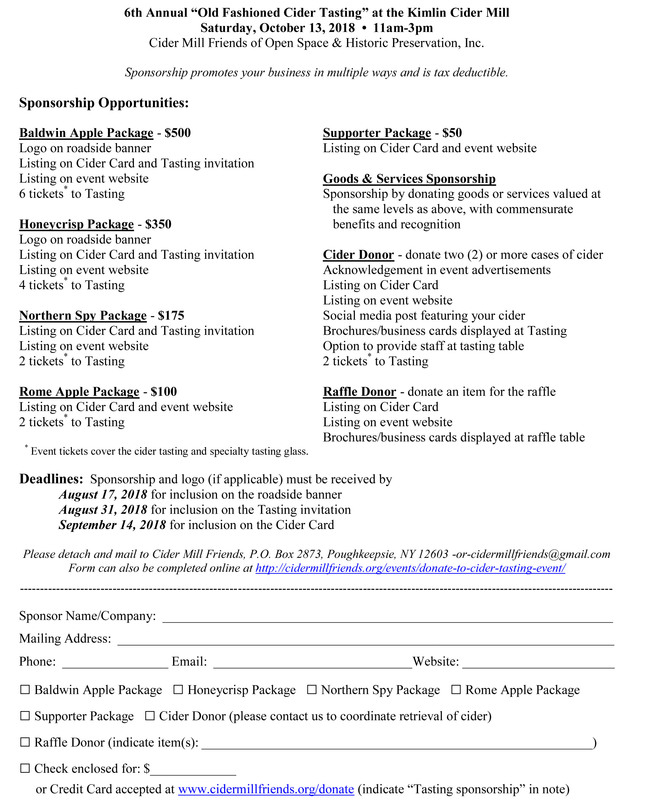 Event sponsorship is a wonderful way to advertise your business and support the preservation of the Mill. We offer extensive promotion of sponsors, fully described here and below. The roadside banner on Cedar Avenue advertises the event to nearly 2,500 cars per day; invitations are mailed to 750 supporters; emails go to 450 subscribers; the cider card is handed to our hundreds of guests; and the event and sponsors are shared through our website and Facebook page with 500 followers. 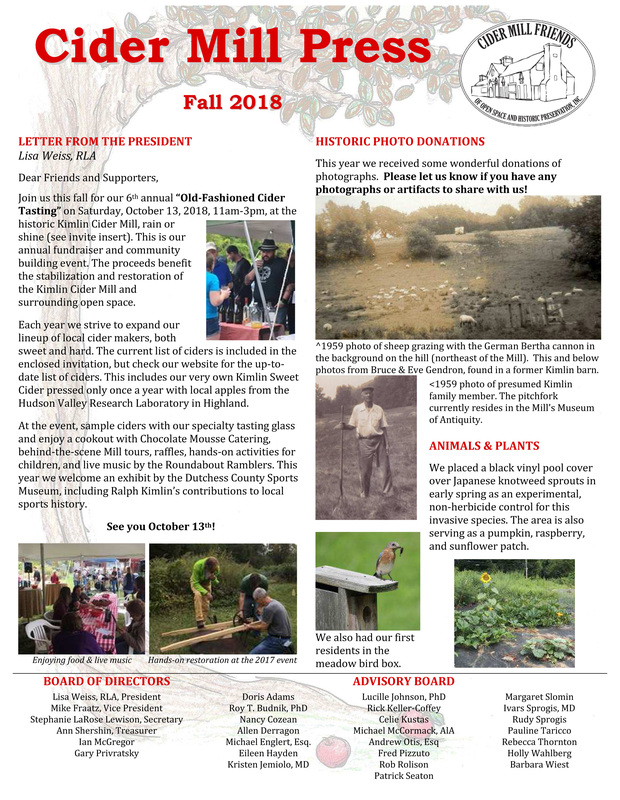 As a 501(c)(3) non-profit, all-volunteer organization, Cider Mill Friends fulfills its mission to restore this beloved local landmark through community support and donations. You are proudly preserving the Mill today and, for our most important asset: our future generations. We actively participate in multiple educational and community endeavors. Over the years, Cider Mill Friends has provided a special place for community service opportunities to many students from our surrounding schools and home schoolers. This year we worked with Habitat Vassar at Vassar College and SUNY New Paltz students, along with other volunteers, performing a myriad of activities including various repairs of the interior and exterior of the Mill, orchard fencing, historic metal cart, and drive chain to the press room conveyor belt. In addition, the volunteers assembled a window inventory, sketched the two chimneys to record existing conditions, performed exploratory excavation for a future sewer line, and removed invasive plant species. We look forward to you joining us as a Cider Tasting sponsor! This entry was posted in Uncategorized on July 14, 2018 by cidermillfriends. Our July volunteer work day, originally scheduled for July 7, has been moved to July 14. If you wish to come and help out, please contact us. This entry was posted in Uncategorized on July 6, 2018 by cidermillfriends. Our annual open house will take place Saturday, June 9 from 2:30-5:30pm. Our monthly volunteer work day will be earlier in the day from 9:30am-12:30pm. You are welcome to come to one or both events. The open house is in conjunction with the Vassar College Alumni Reunion Weekend but it is open to everyone. Stop by, say hi, get a tour, tell us your stories, and maybe a treat! This entry was posted in Uncategorized on May 14, 2018 by cidermillfriends. 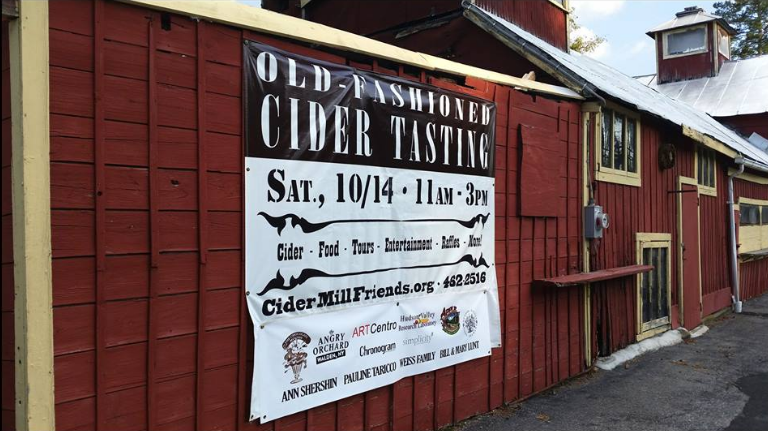 You are invited to join us at our 5th annual Old Fashioned Cider Tasting at the Kimlin Cider Mill! Be sure to purchase your ticket online in order to be entered into an online-exclusive raffle of a growler of Kimlin Sweet Cider! Tickets will also be available at the door, but you will not be entered in the raffle. This entry was posted in Uncategorized on September 9, 2017 by cidermillfriends.